There's a new pre workout stepping on to our shelves, and it's something INSANE. Introducing the New Psychotic; HELLBOY edition! Psychotic Hellboy features the potent stimulant heavy pre workout you already know and love from Psychotic but with longer lasting energy! So How Close To Psychotic Is HellBoy? Pretty Damn Close. The formulas are nearly exact with the exception of HellBoy having more active ingredients per servings! Psychotic HellBoy still features a high-stim formula but unlike Psychotic, HellBoy is creatine free. Instead you have Beta Alanine and L-Citruline Malate powering you through your workouts... and 3 variations of caffeine. Psychotic HellBoy features Caffeine Anhydrous, Infinergy DiCaffeine Malate and Caffeine Citrate. With the addition of the trademarked ingredient Ampiberry, Psychotic HellBoy is going to help you get into the gym and keep you powered up after. Psychotic HellBoy currently comes in 3 great tasting flavors: Blue raspberry, Fruit Punch, and Lemonade. How Do I Take PSYCHOTIC HELLBOY? Begin with ½ scoop to assess tolerance. Once tolerance has been tested, you may take 1 scoop 30-45 minutes before your workout. Do not take Psychotic Hellboy in excess of its recommended dosage. Psychotic Hellboy is not intended for use by persons under the age of 18. Do not consume caffeine from other sources, including but not limited to coffee, tea, soda, and other dietary supplements or medications containing phenylephrine or caffeine. 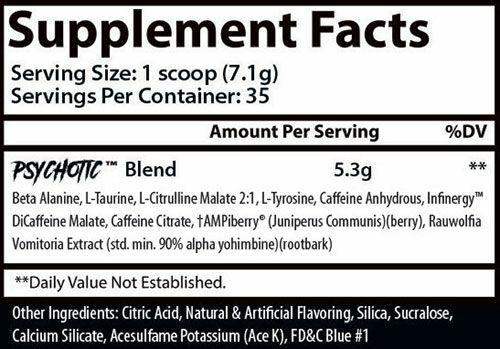 We have a large selection of in-stock Insane Labz products including Pre Workout items and others for the lowest prices at SameDaySupplements.com® It's always easy to shop for PSYCHOTIC HELLBOY BY INSANE LABZ® at SameDaySupplements.com® because you can browse by reviews, brand, prices or search for specific ingredients using our search tool. In-stock orders placed before 3pm EST ship out the same day to USA, Brazil, United Kingdom, Canada, Germany, Australia, Japan, India, France and worldwide at the cheapest prices online.